Electro-Luminescent Panels - Power controlled panels that light up 'blue' in low light conditions for greater visibiltiy. These are seam-sealed to ensure waterproof and are visible from multiple angles. *Requires control unit plug-in. Reflective Taping - For greater visibility in low-light conditions. 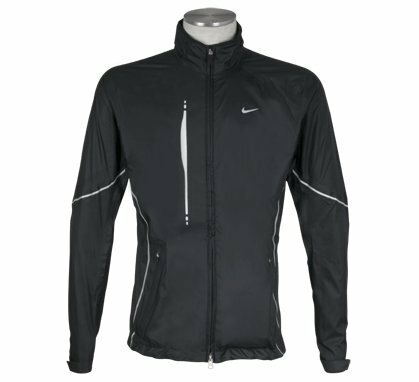 Clima-Fit Fabric - This garment features Clima-Fit fabric to help keep you dry and comfortable in light weather conditions. Pulse Control Unit - An additional control unit that comes with the jacket, easily plugs in to provide power to the electroluminescent power. PULSES ONLY. NOT CONSTANT. Media Pocket And Nike+ Clip - Pocket provides a location to keep your MP3 player/Phone and an additional clip for your earphones runs up the interior of the jacket to keep you earphones from getting tangled or distracting you.